Graduating senior Abigail Rae Whorton-Clark receives a hug from Green Mountain High School Principal Colleen Owens at the school's graduation on May 17. Family and friends celebrate with Green Mountain graduates following the ceremony at Red Rocks on May 17. Green Mountain student Haylie Johnson celebrates her graduation with her family following the ceremony at Red Rocks on May 17. "This isn't closing night for us," senior speaker Brandon Henry said. "This is opening night, and now, our performance begins." Green Mountain graduates receive a diploma and a hug from Principal Colleen Owens at Red Rocks on May 17. Green Mountain senior Dave Goodman introduces the graduation ceremony's faculty speaker, Mark Goodman, who also happens to be his father. 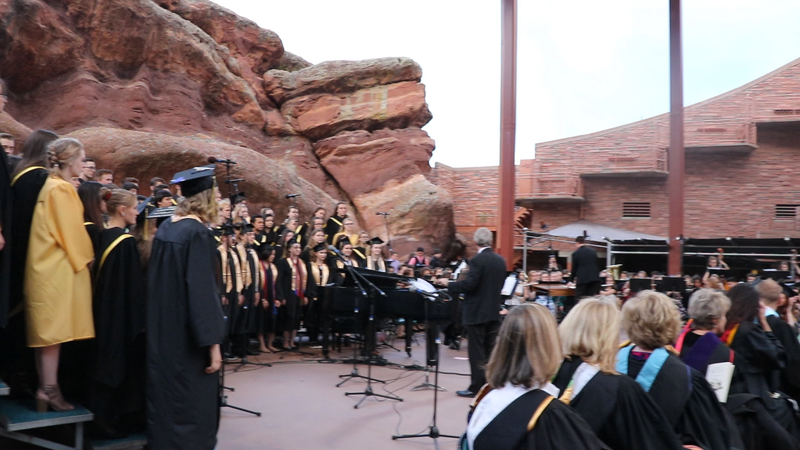 Green Mountain High School seniors take their seats at Red Rocks for their graduation on May 17. It was a mostly celebratory evening for Green Mountain High School's Ram Nation as it said goodbye its 233-student 2018 graduating class. But there's always a little sadness when students leave for the next stage of their lives. "You can never step into the same river twice, but when you stay stagnant, that's when its time to worry," said principal Colleen Owens. "I'm proud of each and every one of you, and know we're sending you forward into a future full of happiness and success." For the students themselves, the ceremony was a chance to celebrate the little moments, as senior speaker Sydney Weathers advised, and realize the importance of being part of the Green Mountain community, as faculty speaker Mark Goodman advised. "I'm excited about what's to come, but I'm also terrified," admitted valedictorian Sophia Slemons. "Let's reflect fondly on our memories and imagine our futures." While the future is unknown, the teachers, family members and friends who helped the school's 44th graduating class along the way are sure they're ready for the next step. "Engage in your community and take responsibility," Owens said. "From this night forward, it's up to you."